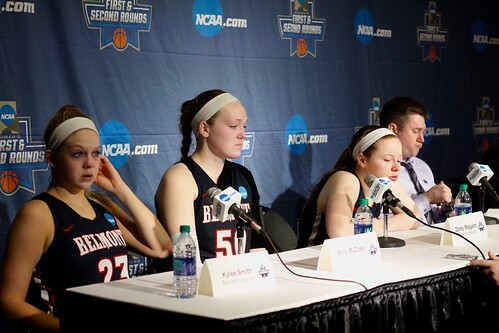 The Belmont women’s basketball team’s historic season came to a heartbreaking close Saturday, following a tough 72-58 loss to No. 5 seed Duke at Stegeman Coliseum in Athens, Georgia. Head coach Bart Brooks said he was proud of his team despite the loss. The No. 12 seed Belmont team held Duke to a close game for the entire first half, ending the first quarter trailing by just two points — the second by only one. The Bruins even took a brief lead over the Blue Devils late in the second quarter, after junior Ellie Harmeyer knocked down back-to-back threes. It wasn’t until halfway through the third quarter when a reorganized Duke squad rallied behind a surge of scoring from Leonna Odom and Rebecca Greenwell, and ended the quarter up 53-40. The Bruins — ultimately unable to overcome the deficit under a smothering Duke defense — fought until the end. Seniors Kylee Smith and Sally McCabe kept their team within 10 for much of the fourth quarter, with Smith leading the Bruins with 20 points. Smith spoke to the Bruins’ relentless fight against the Power 5 conference Blue Devils. Junior Darby Maggard, who was kept to just 4-12 in scoring by the Blue Devils, tallied 12 points for the Bruins. Junior Jenny Roy also kept Duke’s All-ACC guard Lexie Brown to just 3-10 in shooting, a defensive feat against the 20 points-per-game shooter. McCabe grabbed four blocks, and ended her Belmont career with an incredible 291 career blocks — an OVC and Belmont All-Time high. Playing for the Bruins and building the program over her four-year career was an honor, she said. Brooks also spoke highly of the this year’s graduating class — Smith, McCabe and Sierra Jones. The Bruins ended their season 31-4, undefeated in conference play for the second consecutive year, ranked No. 23 in a national poll and reigning, three-peat OVC champions. This article written by Zach Gilchriest. Photos by Carina Eudy and Zach Gilchriest.